Acrylics Anonymous, Issue #063 -- Dinosaurs Holding Butterflies. 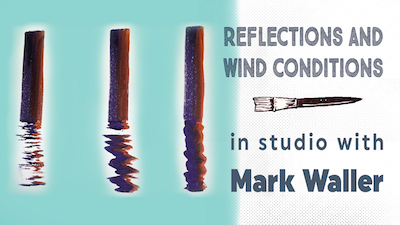 In this quick and simple tutorial exclusive to you, learn how to paint your reflections to represent prevailing wind conditions. Look at the quality of the light on objects - this will tell you something about the texture of it. Harder shinier surfaces will have sharper & clearer reflections, while a duller and more diffuse reflection will suggest texture and/or grain. Remember this when painting so you can create texture and tactility in your work. Moral of the story? Observe! Trying to find something on the explore site but have no idea where it went? The sitemap is a really useful resource to help you unearth your favourite pages again. The More on Water DVD is in the final stages of production and will be available soon. Don't forget to pre-order your digital version - this will be available to AA subscribers first! Click here to pre-order your digital copy now. 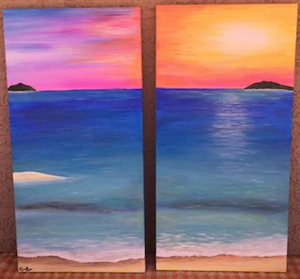 Read more about Pam's Sunset Scene here. Here at AA we are a *teens* obsessed with water in all its forms. To this end you definitely need to see this beautiful ocean photography from Ray Collins. Scroll down to “The Infinite Now” for mesmerising cinemagraphs. Absolutely beautiful. When you’re sufficiently melted, head on over to his landscape seascapes for some simply stunning still photography. Click here for Ray's photography. Li Hongbo is a Chinese book publisher turned paper sculpture. He makes fantastic, intricate, moving paper sculptures. 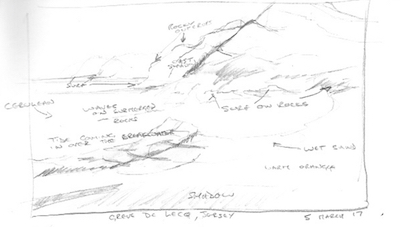 Click here for a quick insight into his fascinating processes. Click here to see Li's compelling sculptures. My story with art is something of a long meander over many years and I attribute much of my current success to Mark Waller and this Website even though I’ve never physically met Mark or indeed Frankie. I painted a lot as a child and even won a prize or two at school, but we were from a pretty poor family and access to decent equipment, books and a mentor was limited. I did have a tentative conversation with Dad about going to art school, but there was no money to fund me and indeed no perceived job or career at the end of an art degree. And so, in the busy world of work, marriage, children and then single parenthood, my interest in Art got pushed aside and was limited to the occasional sketch or evening class. Then, some 30 years later, my (new) husband encouraged me to join an informal painting group in our village. My first works were desperately poor and I felt utterly dejected … where was the intuitive use of colour that I had been so complimented on all those years ago? Gradually I could see an improvement … but I had such a vast amount to learn and I really needed a tutor or “guide at my side”. Fortunately the internet was my saviour and I was inspired by Mark’s work and the Acrylics Anonymous ezine and Explore Acrylic Painting site. Mark’s teaching was terrific and all the hints and tips on the site really built my knowledge in super-quick time. I remember my nervousness the first time I posted a painting on community pages (2012) but was really buoyed up by the supportive comments and feedback. My artwork has become an important part of my life and I have now set up a studio, a website and held a series of exhibitions. Last year when a gallery agreed to represent me I took the decision to “go professional”. 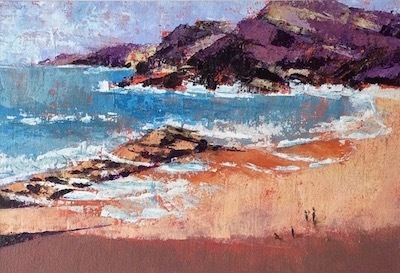 This Painting (Greve de Lecq, Incoming Tide) was something of an experiment and I didn’t expect it to “turn out”! I came across the scene whilst visiting my daughter who lives on the Channel Island of Jersey. 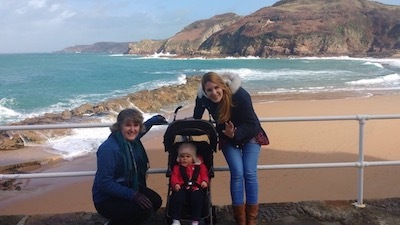 It was a wonderful bright and breezy early Spring day and we walked to the beautiful beach at Greve de Lecq. The spring sunlight made all the colours sparkle and I couldn’t resist taking a few notes and a photo or two. My sketches, like this one below, are really basic, just capturing the important things that make the scene come alive … but I find that they are enough to recreate the scene in my mind. One of the things I really liked about this scene is the shadowed foreground – firstly the shadow adds interest in an area that that was lacking in compositional interest and secondly it also defined the shape of the land behind me – ie it’s obvious that I am stood above the beach and there is land rising up behind me. 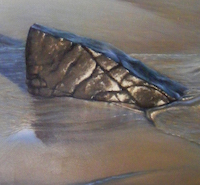 Jersey is a granite outcrop in the middle of the English Channel and this stone gives the cliffs and sand a lovely warm orangey glow so I decided to bring this out by using a bright orange (Cadmium Red Light) ground. I like to work with a limited palette so that the painting is cohesive rather than a mass of conflicting colours. So, for this painting I chose Dioxazine Purple, Cerulean Blue, Cadmium Red Light, Transparent Raw Umber and Titanium White. The purple and blue are opposite to orange on the colour wheel and this immediately creates a visual buzz. I also decided to use palette knives rather than brushes as I thought this would suit the rocky nature of the scene and would allow glimpses of the orange ground to show through. The painting was completed in two main stages – the underpainting which blocked in the main darks and then the lights were added on top. The figures on the beach were added to give a sense of scale. Sadly, I didn’t take any progress pictures of the painting but there is a romantic addendum to the story! A few days ago, I received an email asking whether the painting was for sale. The enquirer was looking for a first wedding anniversary gift for his wife and had come across my painting on the web. Their marriage had taken place in an old Fort that sits on top of the hill behind my sketching spot. The couple had made their wedding vows looking over this wonderful view. Naturally I was delighted that my painting should become such a lovely gift. Thanks so much Jane for sharing your artistic journey and lovely painting with us!